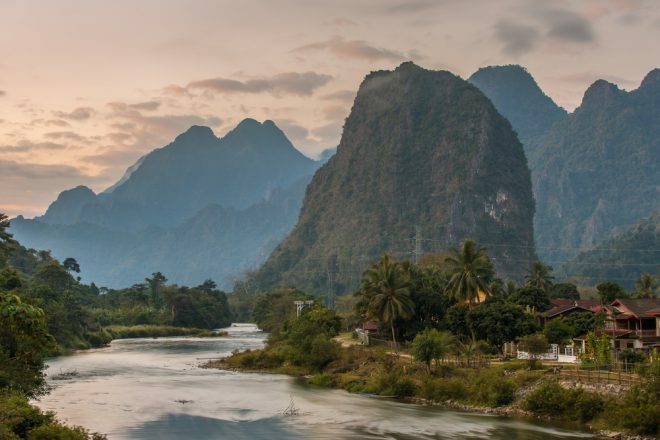 If you’re familiar with the Southeast Asian backpacker circuit, aka the Banana Pancake Trail, you almost certainly know about Vang Vieng – and you’ve probably heard things about it that are… questionable. Once a nondescript village in the mountains of northern Laos, it unexpectedly turned into Southeast Asia’s capital for partying and general hedonism. 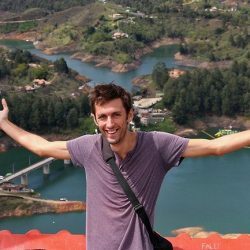 Drunken inner tubing trips, menus listing the drugs available, tourists passed out naked – that summed up the town for most travelers. Thanks to the government cracking down on the most notorious bars, the party scene in Vang Vieng is now a glimmer of what it once was, but the town hasn’t quite shed its reputation as a party hotspot. 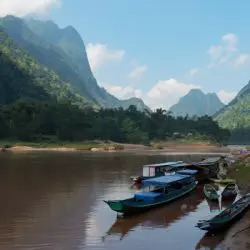 But while plenty of visitors do still come for the slightly-less-outrageous party scene that exists today, there are so many more things to do in Vang Vieng. 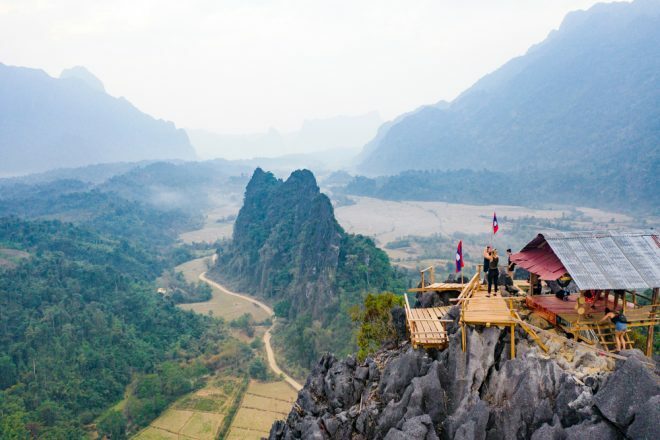 One photo of the karst mountains outside of town is enough to convince most nature-lovers to book their tickets immediately, and that’s without even mentioning the nearby caves, waterfalls, hiking trails, lagoons, and rice fields. So don’t dismiss this town as being a place only for tubing and partying. 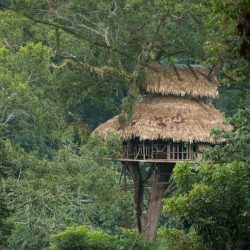 And when you’re there, don’t give in to the temptation to sleep until noon, or you’ll miss some of the best things you can do in Vang Vieng. “I really regret getting up early to see that beautiful sunrise,” said no one ever. And where better to watch to sun come up than in a place renowned for its natural beauty? Yes, technically you could also stay up to see the sunrise, but with most of Vang Vieng’s bars now required to shut down at midnight, there’s not much to do in the wee hours anymore. The sun rises early year round in Vang Vieng, at about 5:30 in the summer and 6:30 in the winter. If you have an east-facing room on a high floor, you may be able to see the sunrise from your own window. Some hotels in town also have accessible rooftops or patios that will offer a view over town. For the most memorable experience, though, get up extra early and walk to the other side of the river. You’ll be able to stroll alongside the water and see the sun as it comes up over the buildings in town. Compared to most of Southeast Asia, winter in Vang Vieng is mild. But if you’re out in the sun, the heat can still be brutal. And during the rest of the year, temperatures frequently soar above 100 degrees Fahrenheit, with humidity levels almost as high. In a place where the top things to do are outside, avoiding the heat of the day is crucial. For example, both the Pha Ngern Viewpoint and the Nam Xay Viewpoint are hikes that offer stunning vistas at the top. But you have to work for that reward; both trails are incredibly steep, meaning the hikes are challenging and made even harder by the heat in the middle of the day. Cycling through the countryside is another popular activity in Vang Vieng and a great way to experience the relative peace of the mountains and rice fields away from town. But some of the roads are steep and most of them are very rocky, so it won’t be a leisurely ride. You’ll have a much more pleasant time hiking or cycling around Vang Vieng if you do it earlier in the day. Even then, be sure to wear sunscreen and bring plenty of water! Another benefit of doing your sightseeing and adventuring early in the day is that you’ll be ahead of the crowds. 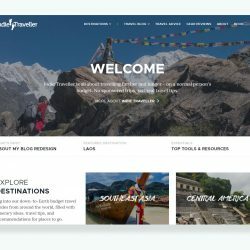 And in a place like Vang Vieng, where the top attractions overflow with package tour groups and throngs of backpackers, that’s especially important. Blue Lagoon 1 is probably the area’s most-visited attraction. 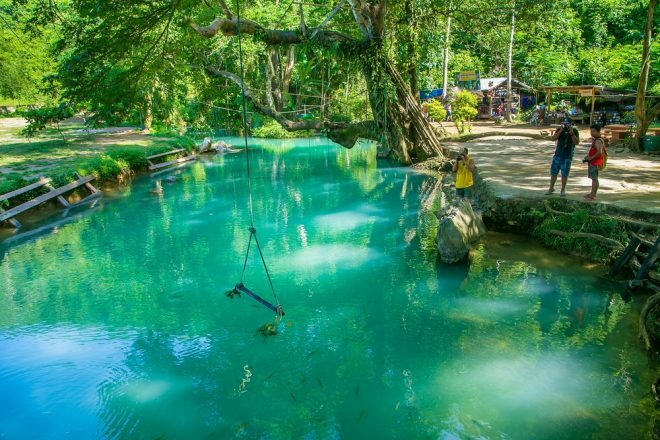 A large swimming hole filled with bright blue water, beneath rope swings and zip lines, and surrounded by green space, it checks a lot of boxes. (There are three blue lagoons near town, but #2 and #3 can require riding over horrible, rocky roads. #1 is much easier to access and is by far the most popular.) But while it would otherwise be an idyllic setting, the lagoon gets absolutely packed with visitors. Another top attraction in Vang Vieng is Jang Cave, which is also easily accessed from town – you can walk there in about twenty minutes. A huge cave with fascinating features, it’s well worth a visit. But the narrow walkways inside can get crowded if you’re there at the wrong time. These and other sights around Vang Vieng are a lot more fun if you have them to yourselves, so it’s worth making the effort to get there before the crowds descend. 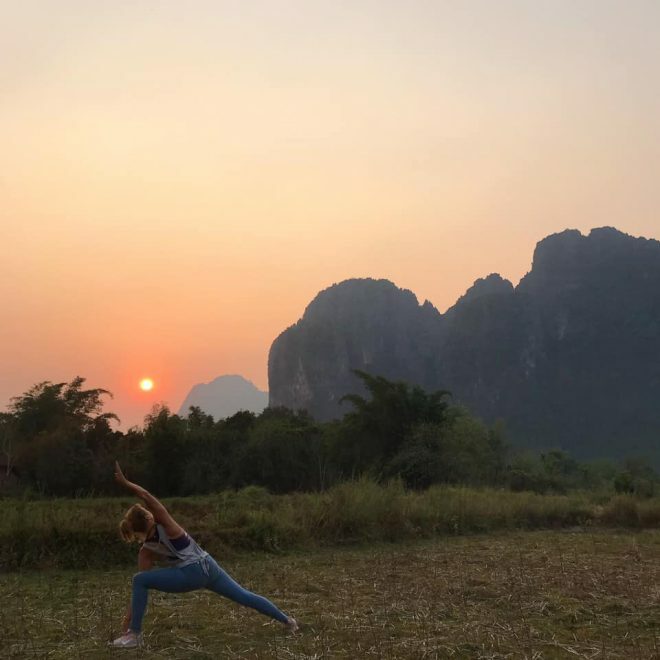 My own experience in Vang Vieng was far removed from the once-pervasive tubing and nightlife scene, in part because I came to the town as a yoga teacher. I taught for a few months at the town’s only studio, Yoga in Vang Vieng, which holds two to three classes a day. The first one is at 7:30 every morning, and maybe I’m biased, but I’d say doing yoga is a good way to start the day. The studio offers different styles of yoga, depending on the teachers who are in town at any given time, so check the schedule before you go. All levels are always welcome (even if you’ve never done yoga before), and the classes are generally small. Luang Prabang, the country’s top tourist destination, is famous for its daily alms-giving ceremony, or tak bat. During the pre-dawn ceremony, monks walk silently through town collecting offerings, mainly of money and rice, from Buddhist residents. 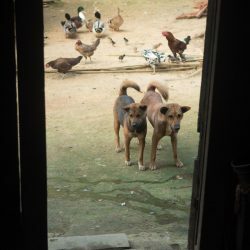 But what was once a quiet ritual for Laotians has turned into a something akin to a zoo exhibit. The main street in town swells with tourists waiting to see the monks, shoving cameras in their faces, and apparently forgetting everything they’ve heard about the cultural norms around respecting monks. Others participate in the ceremony themselves, making offerings to devotees of a religion that’s not their own. But while Luang Prabang’s ceremony has become a massive spectacle that exhibits the worst characteristics of tourism, similar rituals occur in most predominantly Buddhist towns, including Vang Vieng. The ceremony there isn’t a tourist attraction; there aren’t any advertisements for it or directions on where to stand to see the most monks. 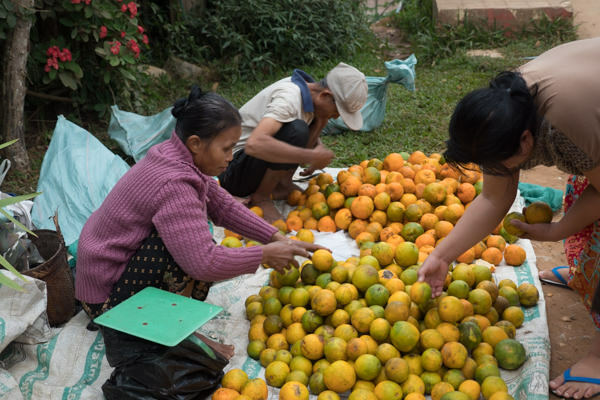 It’s a simple ritual and a true part of daily life for average Lao people. I imagine it’s similar to what tak bat looked like in Luang Prabang before it was discovered by tourists. To try to catch a glimpse of the ceremony, stand near Wat That on the north end of town before sunrise. And please, please, be respectful. Dress conservatively, stand on the other side of the street, and don’t inject yourself into the ceremony if you aren’t Buddhist. Vang Vieng’s two walking street night markets, which begin around sunset, are popular places to find gifts and souvenirs to bring home. But for a more local market experience, you’ll need to get up earlier. Walk away from the touristy center of town, and you’ll find smaller roads lined with informal stalls selling produce and fish, as well as some ready-to-eat dishes. This is how many local people do their grocery shopping or pick up breakfast. You can also browse the town’s main market, about two kilometers north of town, at any time of day, though it tends to be a little livelier in the morning. 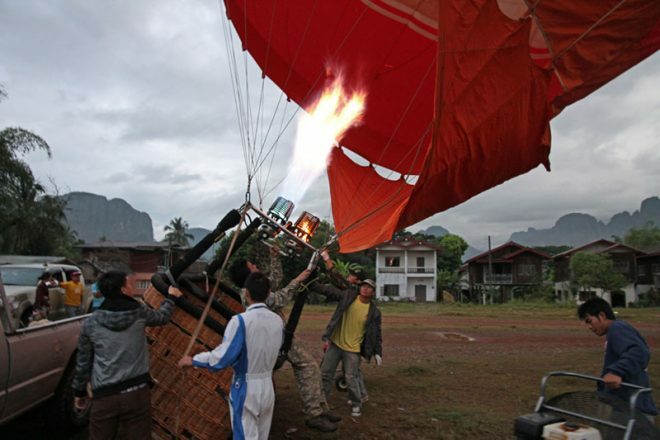 You probably wouldn’t expect Vang Vieng to be a major ballooning capital, but this little town has the most affordable hot air balloon rides in the world. Riding in a balloon there will give you a whole new perspective on the area’s iconic limestone mountains and lush rice fields. The balloons take flight twice a day, but the early-morning slot means getting to watch the sunrise from up in the air. It will still be dark when you get picked up to go to the launch site, where you’ll be treated to the show of the balloons being inflated. You’ll climb into the basket, and the balloon will gently start drifting upward. Floating through the open air, a thousand feet or more above the earth, is somehow exhilarating and peaceful at the same time. Just remember to bring a hat, because the flame that’s just overhead creates a lot of heat. If taking a hot air balloon ride has always been on your bucket list (or even if it hasn’t), the price and the landscape make Vang Vieng a great place for it. And a once-in-a-lifetime experience is well worth the early alarm. The Blue Lagoon 1 looks very nice. This isn’t your luxury type of vacation but I love the quirks of Vang Vieng. This wasn’t on my list until today and I think that’s great. Thanks for convincing me!